I have this back pain problem on and off for a long time already. 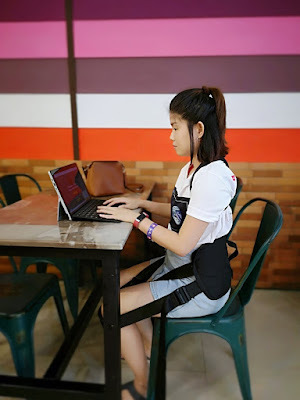 I knew sometimes I tend to hunch back when standing position and also I can't sit straight too (you know the typical Ah Lian type with one leg up on chair..haha..). So I have gone for the orthopedic consultation and did imaging. My report is not too serious to do any medical procedure. Luckily but the back pain problem is still present so I have to find a way by adjusting my job and lifestyle. If you don't know me I'm working in the medical line and also I like to share about health, beauty and lifestyle content with you thus 'missy forward beauty' was created. How bad is your back pain? Back pain is a very wide and serious topic to discuss in medical line but don't worry you can access yourself first using pain scale chart as below. If you experience moderate pain onwards and prolong for more than 6 months, I recommend you to seek medical professional advice first. If you only experience on and off pain to mild like my case this is what I can recommend you by adjusting your job and lifestyle. You heard it before do stretching exercise to reduce back pain, go for swimming activities to strengthen back muscle and many that you can try to help your back. Warning always listens to your body cause sometimes it may get worse then please seek for professional advice. One of the way to help your back pain is wearing spine braces. Introducing a new brand in the online market, Kiper. Well, we all know that they're many in the market that you may have seen but most of the time you may not sure it's suitable or comfortable for you or not before purchase it. I went thru the doubting moment too. What do I think about Kiper? Kiper only carried 2 type of spine braces which are the upper back posture corrector and lower back support. First of all both braces are very easy to wear immediately without any help. The products are light weight and also portable to carry. Meaning you can use them at almost anywhere at any time. Just remember to bring it along with you. The materials are comfortable, breathable and durable. I can say it is fitted and good quality products ensured from my side. In details, I like how the upper back posture corrector pull back my shoulder to prevent hunch back posture. However, I'll recommend you to wear comfortable shirts covering up to armpits for a layer of comfortable on your skin. I also like the lower back support idea that doesn't cover up the whole tummy, unlike braces that I knew before. I can lean back wards for comfortable sitting and this feeling is even better than any type of chair. However, I do not recommend you to wear it at all when driving. The brain behind Kiper is the Master Chris Leong a Malaysian chiropractor recommend to wear Kiper braces for at least 15 minutes a day to relieve back pain. I have been wearing it most of the time when sitting and doing my work with lappie. I can feel it has improved my back posture and less back strain experience. I highly recommend Kiper to you and anyone that you know that may need this back support. Where to buy Kiper braces? Go to link www.kiper.store now. Note you need to pre-order first as it comes by batch. I find pricing is very reasonable and affordable to own. You also can visit Kiper Facebook for promotions update. Thank you, Kiper, for introducing this new brand braces to me that fit my needs and I'm way happy to share these good products with you all too. This post is a collaboration of Leeyann x Kiper.